The interstate highways, everyone agrees, killed the city. It started in 1939 with six simple lines on a map, lines that would later become I-5, I-55, and I-95 going north to south, and I-94, I-80, and I-40 going east to west. In the next two decades, these highways destroyed everything in their path and changed the way everyone lived. With their limited-access, grade-separated interchanges, they allowed people to travel in comfort and safety at great speeds. 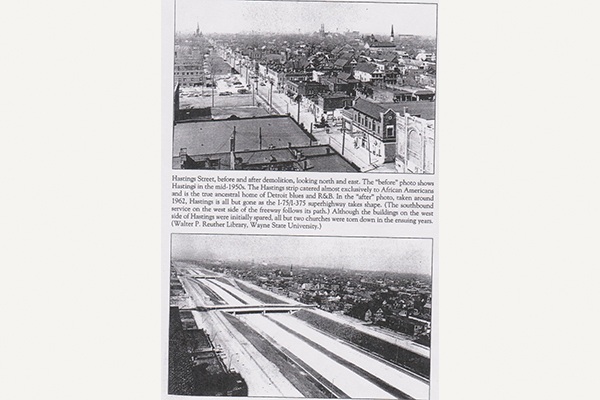 Wealthy whites used these highways to move at great speeds out of the city, taking their property taxes with them, returning only once in a while to go to work in office towers with underground parking. And if it wasn’t enough for the highways to work through simple subtraction, they also worked through outright destruction. Highway men plowed interstates through the poorest and politically weakest parts of cities so as to remove “blight.” They also consciously used the highways to segregate rich from poor and black from white. In the thirty years after World War II, suburbanization and “slum removal” delivered a one-two punch to American cities from which they are only just now, and only in some places, recovering. The familiar story has much truth to it. But there was also a time when, far from hoping that the highway would kill the city, urban planners and architectural visionaries believed that only the highway could save the city from the suburbanization and traffic congestion that were thought to be destroying it. 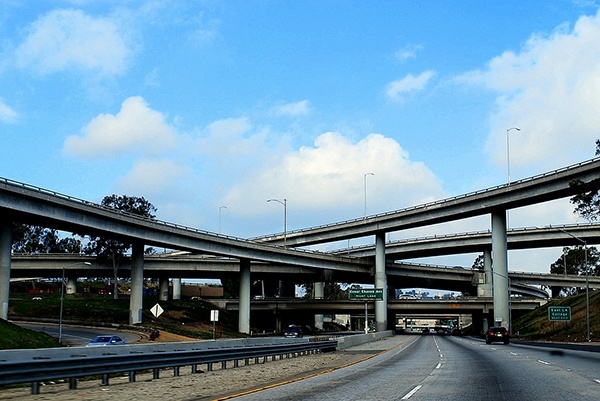 To understand the history of the postwar interstates, we need to go a little further back. Before cement highways killed the city, natural highways — the winds and currents that circulated the people and goods of the Atlantic world — gave birth to them. New Orleans, sitting as it does at the mouth of the continent’s natural highway network, the Mississippi River system, was once second only to New York as an entrepôt. Boston and San Francisco are so alike because of their shared history. Though landfill now obscures this, the narrow Boston Neck was once the only connection between the urban island and the mainland. So too was San Francisco merely a toehold for ships until technology and competition drew the main port south to Los Angeles. Likewise, Boston’s trade moved southwest to New York, where the first important artificial highway, the Erie Canal, provided a better link to the burgeoning hinterland. In the middle of the nineteenth century, the iron road quickly supplanted the canals and dirt and gravel turnpikes. Cities that had been sited by the hand of God began to compete with cities arranged by the hands of men. Chicago displaced St. Louis not by virtue of its lakeside location but because the railroads came. Atlanta, Georgia, far away from river, ocean, or mountain pass, is where it is because the builders of the Western & Atlantic Railroad chose the spot for its easternmost terminus. It takes imagination now to realize how difficult overland travel was before the railroad. It moved at walking speed. (The famed Pony Express carried mail for a year and a half before the telegraph killed it.) The railroads changed that forever. Strangely enough, the railroad had limited impact on the city form. Between cities, the rail lines followed the easy route through the mountains that nature had already found when it made rivers, and once the rails reached a city, no one objected to their staying on the riverside. In our era of high-priced waterfront real estate and city parks, it may be strange to think of the riverbank or shoreline as the best place for a sooty, coal-fired railroad. But at the time, the waterfront, with its ships, warehouses, odoriferous cargoes, and perhaps equally odoriferous and transient seamen, became home to saloons, brothels, and other undesirable forms of commerce. Sewers, such as there were, also ran untreated through storm drains into the water. To separate the city from that mess seemed to many a blessing. Across the tracks from the riverfront, the American city remained the merchant’s walking city with land at the top of the hill most valuable, as long as it was close to the action. A wealthy ship-owner could stroll from his mansion atop the hill the short distance down to the New Bedford docks to check on his cargo of whale oil. The working and middle classes lived “above the store” or otherwise close to their places of employment; the word “commuting” only took on its journey-to-work meaning near the dawn of the twentieth century. Poor and rich lived side by side, though in different conditions. City streets became increasingly congested as the city grew, congested not only with traffic but with commerce (pushcarts) and leisure (a good game of stickball). Density choked out light and air. In Chicago, the slaughterhouses blackened the sky and turned the water into industrial waste. Cleveland’s Cuyahoga River is best known for catching fire in 1969, but its industrial waste had caught fire thirteen times before, including in 1868, 1883, 1887, 1912, 1922, 1930, and 1952. The ever-increasing number of horses in the city fouled the streets, though their waste made a thriving business, as did their carcasses. As if these forms of pollution were not abhorrent enough to the upper-class, native-born white Protestant population, the cities were becoming “polluted” as well with new migrants. Irish and Roman Catholics, Jews, and other un-American types were settling in. The WASPs wanted to get out of town. Horsecars (horse-drawn trolleys on iron rails) and then electrified trolleys allowed them to do this. Electrified trolleys especially, with their standard nickel fares, brought the dream of an English country home down the economic ladder. Two things are worth noting at this point. First, just as the interstates eventually created and reinforced geographic segregation by race and class, so too did the streetcars. As the urban historian Sam Bass Warner has shown with regards to Boston, the “streetcar suburbs” created concentric circles around the central city. The layout of the lines ensured that the wealthiest would be able to live farthest from the city; they had stable jobs and could locate their homes along the longest lines. For those one step down, employment was less stable, so they often needed the flexibility of crosstown lines. And the lower class was still stuck in the city. In other cities, segregation was more explicit, as developers created “whites only” communities at the ends of streetcar lines. The legacy of these racist policies endures. For example, Chevy Chase, on the border with Washington, D.C., began as an exclusive community. Today, African-Americans make up about 1 percent of its population, while in the surrounding areas blacks make up 18 to 25 percent of the population. The same forces of land speculation that built the streetcar suburbs would also build the postwar automobile suburbs. The United States developed rich in land and relatively poor in population compared with its European forebears. It lacks the tradition of regional, centralized planning found in Europe and elsewhere, so developers have fairly free rein to locate their subdivisions. Absent any transportation or land-use planning, housing developments pop up as randomly as mushrooms, driven ever outward by subdivision economics. Given that there is more continuity than change between the forces that shaped the pre-automobile city and the automobile city, one might conclude that the automobile just brought more of the same. And it did. More segregation by race and class, more spreading of the city. There are, however, important differences. The automobile as a vehicle of individualized mass transportation was new in its profound incompatibility with urban density. Cars simply need far more real estate than mass transit, whether they are moving or parked. The space problem also reflects the new ownership pattern. All previous forms of mass transportation were sold as a service—buy a ticket, get a ride. With cars, individuals buy the vehicle itself. Individual ownership means cars are parked much of the time, taking up space in the middle of the city for hours and days at a time. Their right to use the streets for moving and storage was challenged in the early years but upheld by the courts. In 1925, the nation’s leading municipal traffic engineer, Miller McClintock, complained that the public at large, rather than the motorist, bore the cost of parking in the city. “After all,” said McClintock, “the ability of a transportation vehicle to bear the terminal charges at both ends of the run is not a very severe test of its utility.” The car would have failed that test, but it was never administered. Resident car owners wanted free parking on the streets, and so did downtown business owners, who feared a loss of the high-value “carriage trade.” City leaders wanted to ensure that there was enough space for street parking lest businesses move out of the central business district to cheaper land where they could offer free parking. In the face of all this, off-street garages that might have kept the cars out of the way rarely made sense, competing as they were against free alternatives. Surface lots meanwhile started appearing when land prices fell after businesses moved out. Landowners turned vacant lots over to parking in order to at least stay a oat until something better came along. 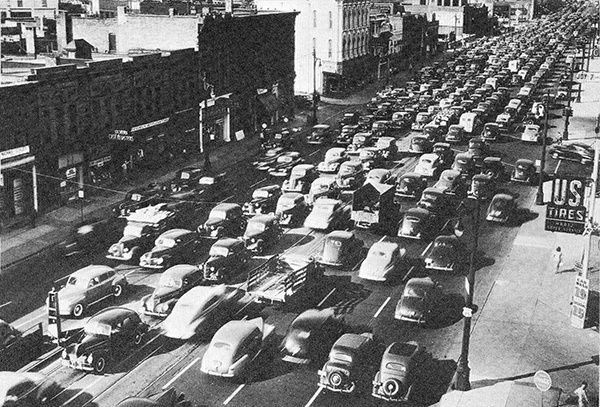 As a result, long before the advent of superhighways, the automobile began reducing available space downtown for businesses and for housing. The second important characteristic of the automobile and the superhighway is that they were central to modernist plans. In 1916, Arthur Hale earned a patent for what has become known as the “cloverleaf” interchange, so named because its on-ramps and off- ramps resemble a lucky four-leaf clover. The first U.S. cloverleaf was built in 1928 at the intersection of Routes 1 and 35 in New Jersey and lasted until being replaced by a more modern example in 2001. World War I proved the need for better roads as rail lines clogged with matériel. A 1919 cross-country convoy intended to demonstrate motor transport’s contribution to the war effort and support the good roads movement was hampered by inadequate roads and bridges, making a lasting impression on a young lieutenant colonel who participated, Dwight D. Eisenhower. (Later he would note how quickly cars and trucks moved along Hitler’s autobahn.) The Pennsylvania Turnpike, generally considered the first American superhighway, was completed in 1940. Frank Lloyd Wright took the problem of the automobile to its logical conclusion in Broadacre City, a 1930s concept he developed over many years at some length through books, articles, and models. To Wright, Le Corbusier had not gone far enough. High-density urban forms built at great expense with walkways above roadways above tunneling rail lines looked very modern, even futuristic. Yet he wondered, why preserve the skyscraper and the density of the nineteenth-century city when clearly the automobile rendered them obsolete? If the traditional city was measured in footsteps, Wright’s modern city would be built on the scale of odometer clicks. It was, in a word, urban sprawl, though beautifully imagined. 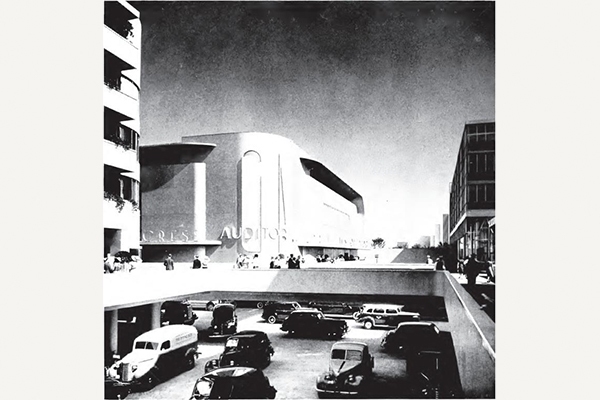 Detail of the Futurama exhibit at the New York World Fair 1939-40, showing a street intersection in the City of Tomorrow. Norman Bel Geddes popularized these prewar visions for the General Motors 1939 World’s Fair exhibit, Futurama. In the city of 1960, according to the most popular exhibit at the fair, well-spaced skyscrapers and elevated walkways to carry pedestrian traffic over wide roads would provide plenty of open space. Staggeringly wide freeways would separate traffic by speed, with traffic being sent below-ground once it reached downtown. In other words, in the United States and France, even in the 1930s, arguments for urban freeways emphasized the existing sub-urbanization and central-city “blight” that most people attribute to the postwar era. Thomas MacDonald, the longtime head of the U.S. Bureau of Public Roads, reported in 1939 that the motor vehicle had made it possible for the middle class to leave the city and commute to work by car. The streetcar suburbs had exploded into automobile suburbs, and it was hurting cities: “The former homes of the transferred population have descended by stages to lower and lower income groups, and some of them have now run the entire gamut. Almost untenable, occupied by the humblest citizens, they fringe the business district, and form the city’s slums—a blight near its very core!” Farsighted highway builders tried to team up with urban planners and federal housing authorities to make high- ways part of comprehensive redevelopment plans. After all, slum clearance was also high on the federal affordable housing agenda. In signing the 1949 Housing Act, President Truman declared, “This far-reaching measure . . . opens up the prospect of decent homes in wholesome surroundings for low-income families now living in the squalor of the slums.” Cities would buy slum areas with federal funds and sell them on to private developers to build housing. The process became known as urban renewal and quickly drew critics. Most famously, Jane Jacobs criticized the program as just the latest example of modernist, rationalist planning, planning that ignored people and destroyed the vibrant, seemingly chaotic city. Her model was her own Greenwich Village, itself once a suburb. For Jacobs, the trouble really began when cities first passed zoning laws to separate industry, commerce, and housing. They thought they were imposing structure and safety (by moving toxic paint-producing factories outside residential areas, for example); in fact, according to Jacobs, they were destroying the natural fabric of city life. Her critique of planning as a whole may overreach, yet looking back at the visionary plans of Le Corbusier and others reveals a striking lack of human beings amid all the cruciform skyscrapers and elevated streets. On the other hand, by the time the highway men came to town, the planners were all but a footnote. The lack of coordination between housing authorities and highway builders made the dislocation of poor communities especially dreadful as little assistance was offered for relocation. To make matters worse, public housing projects like Pruitt-Igoe in St. Louis, and Cabrini- Green in Chicago, looking for all the world as if they had been designed by Le Corbusier, quickly deteriorated into crime filled, high-rise, concrete slums. The plan to use broad streets to revamp the city has a long history. The first Neolithic proto-city, Çatalhöyük, in what is now Turkey, had no streets at all. Houses shared walls and were entered through a door in the roof. Maybe they were onto something, because as cities grew, streets became dismal places. Only in the thirteenth century did the first Parisian street get a drain to carry raw sewage away, meaning that until then (and in most places for a long time to come) the street itself was the sewer. In overcrowded and unsanitary conditions, disease spread quickly. So too, according to the chroniclers of the age, did vice: prostitution, for one, was always associated with the street, as in “streetwalker,” and “street urchin” refers to the especially grimy, indigent children who roamed the streets. Even in the era of sanitary sewers, streets in poorer districts remained crowded warrens. Planners offered radial boulevards to turn over these dismal streets every chance they got. Cleansing res often gave them that chance. John Evelyn and Christopher Wren each offered a plan of radial avenues after the Great Fire of London in 1666. Pierre Charles L’Enfant’s late-eighteenth-century plan for Washington, D.C., featured radial boulevards, and when Detroit burned in 1805, it was rebuilt to Augustus Woodward’s imitation of L’Enfant. When Haussmann renovated Paris beginning in the 1850s, he used wide boulevards to create air and light. We should not forget, however, that France had just gone through a revolution when Napoleon III hired Haussmann. Barricades are harder to build across wide boulevards than across narrow streets. Daniel Burn- ham’s 1909 Plan of Chicago also featured radial boulevards. For him, traffic congestion, not revolutionaries, was the main problem. The comprehensive plan was first and foremost a program for better circulation. The same rationales—both transportation and land reform oriented—supported superhighway construction in the latter half of the twentieth century. The high-minded goals of urban renewal, the desire of owners to boost property values, the need for deindustrializing cities to find a new source of revenue, the federal government’s efforts to minimize right-of-way costs (the poorer the district you built the highway through, the less it would cost to buy the land via eminent domain), and the segregationist agendas of local elites combined powerfully. They ensured that the highways would be built right into the heart of the city to connect it to the national network on routes that divided, displaced, and destroyed poor, and mostly black, communities. If they’d been able to do it earlier, they’d have done it earlier, but it was only with postwar prosperity and a more powerful central government that the money finally came through. During the Great Depression, the Works Progress Administration under Franklin Delano Roosevelt provided the unemployed work building roads and bridges. Even when the war put Americans back to work in the cause of freedom, Roosevelt continued to sup- port planning for future highways as a form of countercyclical, or Keynesian, spending. The 1938 Federal-Aid Highway Act called for a report on creating a national network of toll roads. The resulting landmark report to Congress in 1939, “Toll Roads and Free Roads,” concluded that many remote stretches of the planned national highway network would have too little traffic for tolls to cover costs. Some other funding mechanism would need to be in place. The Federal-Aid Highway Act of 1944 gave a congressional imprimatur to the report, though provided little funding for actual construction. The idea that states should bear a significant amount of the cost—an unfunded mandate—caused opposition, as did the proposal for a highway trust fund supported by a federal gas tax. Finally, in 1956, a plan for a gas tax to support a highway trust fund along with a 90-10 federal-state split for costs won the day and gave rise to the Dwight D. Eisenhower National System of Interstate and Defense Highways. Historians disagree about whether national defense was indeed a central role for the highways. “National Defense” appears in the 1944 legislation, the Pentagon reviewed state plans for routes, and inspiration came from Hitler’s autobahn. But some argue that the military need was just a ruse to ensure support. In any case, defense was at most a secondary purpose and not one that significantly impacted the choice of routes or building of the interstates. With the tidal wave of funding coming from the gas tax, highway engineers had relatively free rein. All the engineer had to do, in the words of one official, was to avoid “city halls, cemeteries, and governor’s mansions.” Routing decisions would necessarily affect property owners, those in the right-of-way and the immediate abutters, and even those farther afield. Middle-class families inside and outside cities suffered. No matter where you live, your property value will plummet when a highway moves in next door. Richmond also claimed a “Harlem of the South,” Jackson Ward, which was bisected and destroyed by I-95. What’s left of the once thriving area is now on the National Historic Register and, according to The New York Times, is enjoying an in influx of Brooklyn hipsters. Highways cut through black communities in New Orleans, Birmingham and Montgomery, Alabama, and Columbia, South Carolina. I-75 razed Cincinnati’s mostly black West End. When planners routed Interstate 40 through a black community in Nashville, residents sued, claiming racial discrimination, and won a temporary restraining order. But they ultimately lost and the highway was built. Detroit’s Black Bottom district was destroyed to make way for I-75 and I-375 and the Lafayette Park housing project designed by the modernist architect Mies van der Rohe. In Boston, it was the Italians and the Chinese who saw the elevated Central Artery, I-93, land atop their neighborhoods; in Providence, Rhode Island, Interstate 95 creates a wall between the Italian North End and the affluent East Side. After crossing the George Washington Bridge, I-95 becomes the Cross Bronx Expressway, perhaps the most notorious highway monster of them all. The story of the Cross Bronx shows how hard it is to arrive at a balanced view of our urban freeways. The standard story of the Cross Bronx Expressway comes from Robert Caro’s biography of Robert Moses, the chief urban planner of New York from the 1920s to the 1960s. Caro portrays Moses as a monomaniacal, unelected bureaucrat out to connect suburbanites with bridges and highways that run roughshod over New York City. Moses seems to have gone out of his way, in Caro’s telling, to drive the Cross Bronx through a working-class Jewish neighborhood, East Tremont, when an alternative route existed farther south that would avoid displacing so many residents. This claim, if true, might tell us something about Moses. But it tells us little about the Cross Bronx, always part of a master plan for New York freeways. Moreover, shifting the highway a few blocks south would merely have shifted its destructive impact, not lessened it. Moses would have continued his “sacking” of New York had not Jane Jacobs intervened. 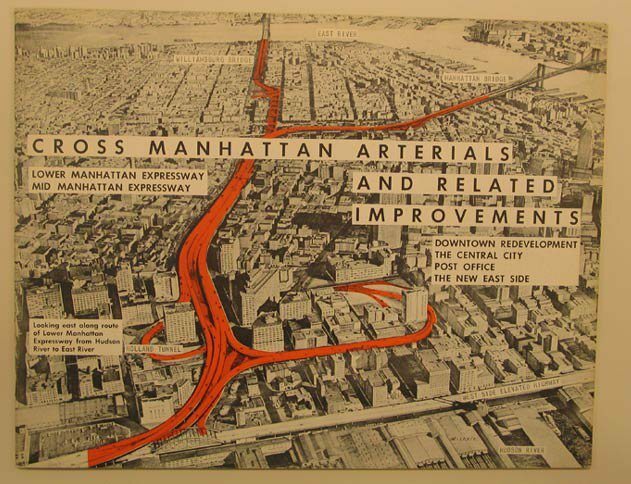 Expressways were only one of her targets; Lincoln Center was emblematic of the folly of planners. They had torn down a vibrant neighborhood—San Juan Hill—to build a sterile oasis for opera fans. But Caro published his account of Moses in 1974, just a year before Gerald Ford told a bankrupt New York, according to the Daily News, “Drop dead.” Today, with New York City having returned to prosperity, historians have rethought Robert Moses. Subsequent research has called into question many of Caro’s claims, including the claim that racism was at the root of many of Moses’s designs. Among the most intriguing stories Caro relates regards Jones Beach: Caro alleges that Moses built the parkways leading to the beach with overpasses too low for buses. He intended to reserve the new park for whites, excluding the poor and black. (Caro’s story was given new life in 1980 when it was repeated in an in influential essay by Langdon Winner.) But travelers could choose among several routes to Jones Beach, and in any case, the buses fit under the overpass just fine. The Columbia professor Kenneth T. Jackson, no friend of sprawl, has suggested that Caro’s view of Moses was shortsighted. Moses, the revisionists argue, should be praised, not denigrated, for helping to keep New York a modern city, connected to the rest of America through its bridges and, yes, its expressways. We cannot know how New York would be different today had the highways never been built or had the plans left on the drawing board been realized. 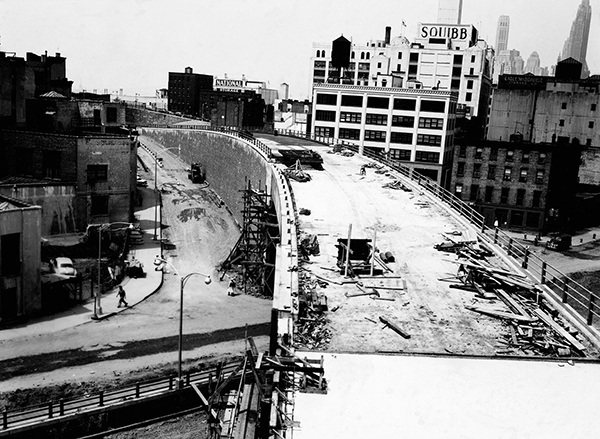 Jane Jacobs and others stopped the Moses plan for a lower Manhattan expressway that would have obliterated SoHo. But would they be happy that the neighborhoods, including Jacobs’s beloved Greenwich Village, have become enclaves for the ultrarich? The highway builders always knew urban freeways would be difficult. “When you operate in an overbuilt metropolis,” Moses famously said, “you have to hack your way with a meat ax.” The highway builders moved quickly to get projects done to outrun the opponents. By the 1960s, however, the opponents caught up. The era of “highway revolts,” as they have become known, began. Dozens of crosstown and linking highways were planned but never built. Civil rights activists stood with environmentalists to block them. The modern city rests on a web of technologies, including sanitary sewers, distributed electricity, safe water supplies, steel-frame construction, and mechanized transport. Without these, cities would stretch no more than a few miles across—or about the distance a person can walk in an hour. They could be neither the teeming home to the diverse millions that are their purpose nor claim the prize as the most environmentally friendly living arrangement for those millions. Each of these technologies, all of this infrastructure, arose to solve urban problems. So it was too with the urban freeways, intended not to destroy the city but to save it. It is easy to romanticize the city of your youth or the storied one of your grandparents’ youth. I know New York always drew me in as a connection to my mother and uncle and grandparents, and hats and pipe cleaners and lace cookies in white boxes wrapped in candy-cane string pulled from a silver orb above the counter. But my Bronx-born mother always told us kids she was from Yonkers, though she only moved there at the age of sixteen. She never talked much about her time as a social worker in Harlem. She loves her house in the suburbs. In other words, if Robert Moses destroyed New York City to build the suburbs, Mom, and millions like her, were right behind him. Today, the worst aspects of the highway in the city are being confronted. Boston buried its Central Artery (never a central vein) at a cost of over $1 billion per mile, and New Orleans seems set to tear down its elevated Claiborne Expressway. Tunneling has become so much less expensive and cumbersome that more urban freeways will be interred, and the public will celebrate, as it did when Seattle brought in “Bertha,” the world’s largest tunneling machine, to worm a new route under the viaduct. Could the Cross Bronx and the Bruckner be far behind? Technology is also making public transport more viable and less expensive, from Zipcars and ride-sharing apps to intelligent transportation infrastructure and driverless buses. The line between public and private transportation might one day be pretty blurry. We might trade owning cars to buying transportation services provided by individual autonomous vehicles. The transportation problem will remain. Dodge Street through Omaha may be riddled with strip malls and parking lots, a depressing realm. A few minutes west, however, it becomes Dodge Road, a grade-separated highway with city boulevards flying over it every mile as if it were part of Frank Lloyd Wright’s Broadacre City. Dodge is also part of Route 6, dedicated to the Union army as the Grand Army of the Republic Highway. It’s one of the longest roads in the country and the one on which Jack Kerouac first set out when he went “On the Road.” For Kerouac, the road served as the antipode to consumerism and the American military might he saw on display in the nation’s capital. Oddly, the interstates have destroyed Kerouac’s road as surely as they have the city. The road trip, on the old two-lane highways a journey of serendipity, whimsy, and the chance to see something new, does not happen on the interstate, whose culture of hurtling speed punctuated by rest stops served by national chains provides a comforting conformity. The interstate highway is very much part and parcel of the military-industrial complex that Eisenhower himself warned of as he left office. The interstate is the ultimate closed road. 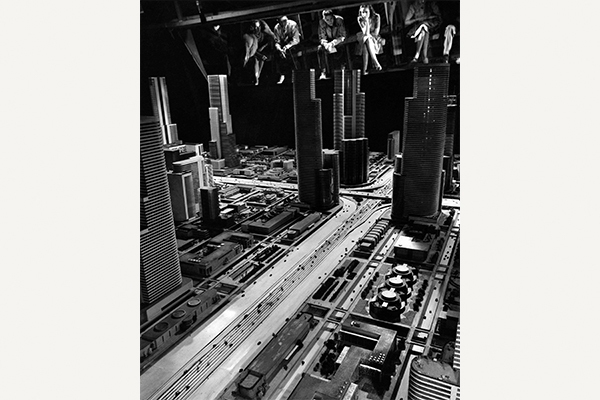 But whereas the plan had always been for the superhighways to supplant the dangerous and unruly Route 6 and Route 66, they were supposed to have saved the city. 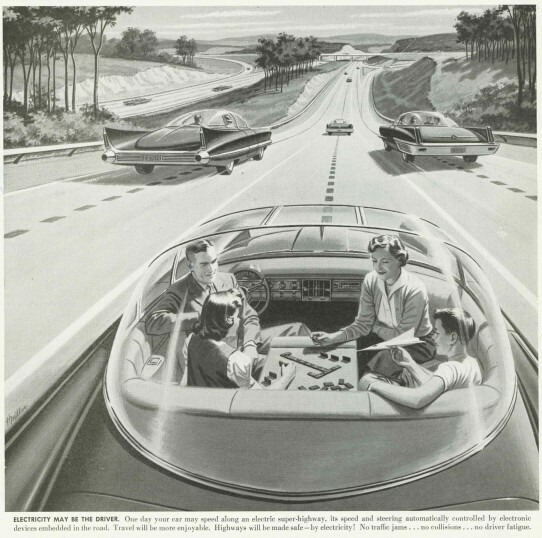 This 1950s advertisement introduced the concept of the self-driving car speeding along electric super-highways. Interring the urban freeway may not reverse the urban agenda that created it in the first place. Some would call it a plan to revitalize the city; others, a plan to separate white from black, rich from poor. If the land freed by burying the road simply opens up more land for high-priced development or, as in Boston, for urban amenities to serve a high-value customer, it will only continue the process begun with the first horsecars. (“New York is a luxury product,” as Michael Bloomberg, billionaire enemy of cars, put it.) Just as the highway could not save us from streetcar suburban development, nor resolve the socioeconomic con conflicts of mid-century America, transportation policy alone cannot transform urban America into the city that we all seem to want. The interstates are easy to hate. But at its best, the interstate is a new kind of creation. I challenge anyone to drive through Glenwood Canyon, Colorado, on Interstate 70 and not have a transcendent moment, or southbound I-295 as it rises over the Delaware Memorial Bridge and lifts you up out of the mire, on I-68 through the Sideling Hill cut in Maryland, or even heading north, on I-71, descending into the Ohio River valley in Cincinnati. These views, this feeling, is the height of the highway engineers’ art. They are of their time, to be sure, so one can hope that the highways of our time will do better. Originally published in City by City: Dispatches from the American Metropolis edited by Keith Gessen and Stephen Squibb (2015).